Everyone is talking about the Mega Millions lottery jackpot, but guess what? You'd have a far better shot at winning if you were to enter one of the following children's book giveaways! And just think of the literacy benefits! Full to the Brim is a list I compile by hand of children's book giveaway online contests. Please check out my other "Full to the Brim" posts as well. Many contests are still underway. I *try to* publish "Full to the Brim" every Friday, though this month my posting have been few and far between. If I missed your book giveaway, feel free to mention it in the comment section or send me an email. Mirror, mirror on the wall, who is the fairest of them all? Are you ready for the newest retelling of the Snow White fairy tale? 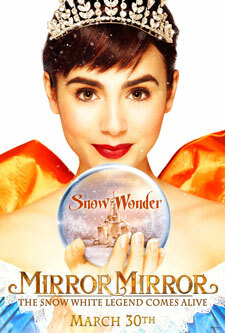 The aptly titled live-action movie, Mirror Mirror hits the big screen tomorrow (March 30). Starring Julia Roberts as the evil Queen and Lily Collins as Snow White, from the early reviews this kid-friendly version sounds like it's going to be a fun if not a bit quirky film to watch! 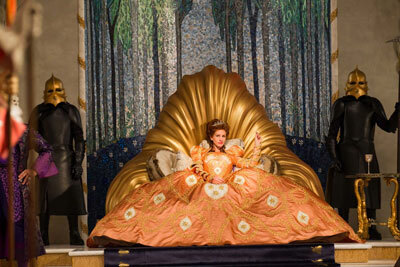 Other cast members apparently add to the humor including Armie Hammer as the dashing prince and Nathan Lane as the queen's bungling servant. The film, released by Relativity Media, promises CGI special effects, lavish costuming, spunky girl power and a Bollywood-inspired dance sequence ending. Find out more about the movie and characters, watch trailers, download a coloring book and more at the official website: http://www.mirrormirrorfilm.com. Social media site links: Facebook or Pinterest. For those that want to gauge whether it's age-appropriate, The Dove Foundation has approved the film as family friendly and provides a review of Mirror Mirror, including a detailed content description. For online learning resources, visit Film Education. They offer a Mirror Mirror curriculum resource featuring interactive learning tools and other activities intended for ages 9-13. It's been too long since my daughter and I have gone on a mother/daughter outing. I think perhaps we'll take an afternoon together and check out this enchanted, princess-y fare. I admit part of the reason I'd like to see this one is because I'm curious to see if Julia Roberts can successfully play a mean-hearted queen. Snow White also happens to be one of my favorite fairy tales. 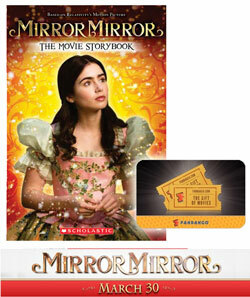 For a chance to win, answer one of the following questions: Do you plan to watch this film variant of Snow White? What is your favorite film variation of classic fairy tale or book? • Contest ends on Monday, April 9th, 2011 at 11:59 PM CST. With the 100th anniversary of the Titanic disaster approaching, I decided to do a little research online to locate educational websites and resources on the Titanic. There's no doubt about it that this ship, this disaster, this part of our history still fascinates both children and adults. The sinking is often referred to as the the greatest maritime disaster in history. But is the Titanic an appropriate topic for children to study? The Associated Press recently released a timely article, "Titanic a magnet for kids, fine line for educators" detailing how some educators and parents balance the tragic details when presenting information about the Titanic to children. I was a student in middle school when Dr. Ballard discovered the wreck of the Titanic in 1985. At that time, books on the disaster became widely available, and I found reading about the discovery and the ship extremely interesting. 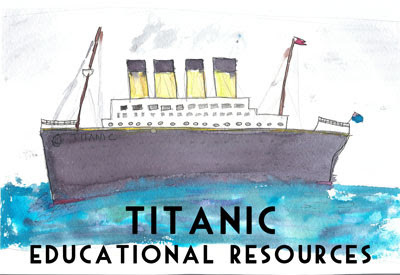 Today, there are even more Titanic resources available for children. As with all sensitive topics, some kids will be able to handle more detailed information than others. If you do decide to talk about the disaster with your kids this April, I hope you'll find this list of online resources useful. Companion guide to James Cameron's film, Ghosts of the Abyss. Activities are designed for use by students in grades 5-8. Lesson plans tied to the RMS Titanic 2004 Wreck Expedition focusing on shipwrecks, biodeterioration and marine archaeology. For grades 5-12. Educational supplement to the film, Titanica. For junior and senior high. Nicely designed guide with seven learning activities encompassing history, geography, science, English and math. Grades 4-12. Six home assignments encompassing math, language arts, history and science. Includes a library book list. "Follow the paths of actual passengers with Macromedia Flash movies." "A treasure hunt game designed to teach the facts about the Titanic disaster." Players must answer questions by clicking on links leading to other websites. The game is rather lengthy and sends you to outside webpages. It also contains an image of a character with a gun. "Historical drama that tells the untold story of the self-sacrifice and bravery of the ship’s engineers, stokers and firemen in the face of impending death." "Join director and Explorer-in-Residence, James Cameron, with a team of Titanic experts, for the ultimate forensic investigation into the most infamous shipwreck of all time." "Oceanographer and Explorer-in-Residence Bob Ballard revisits the iconic ship he discovered in 1985, driven by one question—will the Titanic survive another 100 years?" Len Goodman, the Dancing with the Stars judge, was previously a welder in the 1960's for Harland and Woolf (the same company that built the Titanic in 1912). "He explores the impact of the sinking on the thousands of affected families." Mark the 100th anniversary of the sinking of the Titanic by watching this dramatic four-part miniseries written by "Downton Abbey" creator Julian Fellowes. Visit http://titanictvseries.com for detailed information on this series. "Investigates the safety of cruise ships and questions whether passengers are safe at sea a century later." My daughter has been ill now for over a week. Right now my focus is on her health. I'll be back to blogging when we're healthy again here. Welcome to this week's edition of FTTB! Full to the Brim is a weekly list I compile by hand of children's book giveaway online contests. Please check out my other "Full to the Brim" posts as well. Many contests are still underway. I *try to* publish "Full to the Brim" every Friday. If I missed your book giveaway, feel free to mention it in the comment section or send me an email. It's a Dr. Seuss giveaway edition today!